Collection of Day Orders and other paper items issued on the occasion of the first IDF Oath Day. Israel, 1948. 1. Day Order – "Integration of Etzel Batallions with IDF" [May 1948]. The order encourages Etzel fighters to join IDF and notes that they will join as units. The order also announces that Etzel will continue to fight in Jerusalem as a separate force. 31.5 cm. Good condition. Creases, stains and folding marks. Some tears at margins and folding marks, repaired with adhesive tape. 2. "Day Order for Etzel Fighters", dated June 24, 1948. The organization announces that following the shelling of the weapons ship (Altalena) the fighters will not enlist as units; individuals are not prevented from enlisting. 25.5 cm. Good condition. Stains. Folding marks and creases. Filing holes. 3. "Day Order for Oath Day", June 28, 1948. 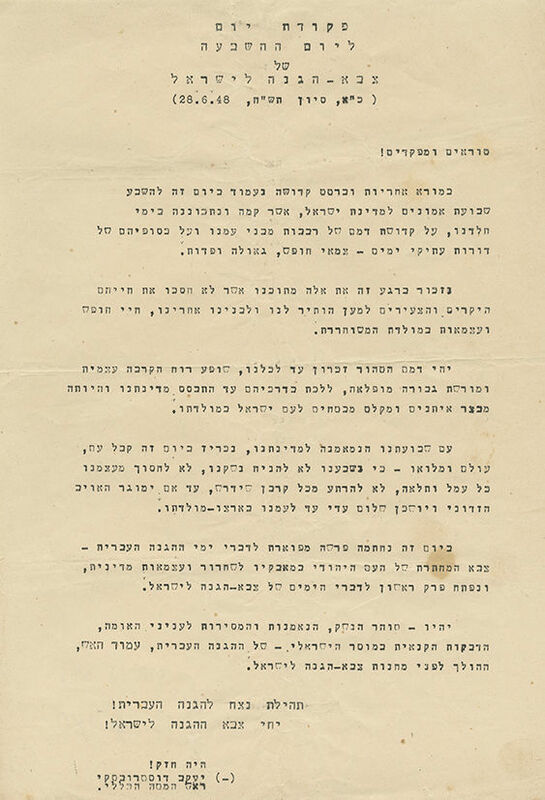 A day order on behalf of Palmach headquarters on the occasion of its fighters swearing in to IDF; ending: "Palmach will continue and participate in enforcing IDF…". 30 cm. Good condition. Stains. Creases. Tears at margins, repaired with adhesive tape. 4. Day order – "IDF Oath Day", 28.6.48. Signed in print by Chief of Staff Ya'akov Dostrovsky [Dori]. The order ends with the words "Military ethics, loyalty and devotion to the nation…. will be the 'pillar of fire' leading IDF" (Hebrew). 30 cm. Good condition. Creases and stains. 5. "IDF Oath", a military form with the text of the oath. The name of the soldier, Ezra Kadir, and the date 28.6.48 are written on the form. 24.5 cm. Good condition. Creases and stains. 6. "Defense-Forces", a booklet issued on IDF Oath Day, 28.6.48, by IDF Culture Department. 16 pp, 12 cm. Good condition. Pen inscriptions. 7. Printed badge with the IDF emblem and the inscription "IDF oath day…". Diameter: 3.5 cm. Fair condition. Tears and blemishes.